Looking for a simple recycled Christmas craft. Try making a pop bottle angel. This craft uses easy to find materials, some of which you probably already have. Let the kids loose on this one and you may end up with a choir of Christmas angels. 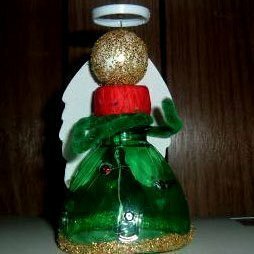 This is a guide about making a pop bottle angel. 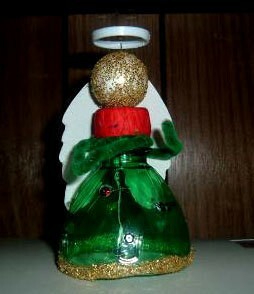 I made this angel out of an empty pop bottle. It's easy to make. Cut the top off of an empty pop bottle. Take the lid off of the pop bottle and wrap tissue paper around it. While your lid is off of the bottle pry off the white ring around the neck of the bottle. This will be your angel's halo. Put the lid back on your pop bottle. Wrap a pipe cleaner around the top of the bottle for the angel arms, under the lid. Hot glue on sequins to the "dress". Smear elmer's glue on the styrofoam ball and roll in glitter. Hot glue on the glittered styrofoam ball to the top of the lid. Put glue at the bottom of the bottle and sit in glitter. Make angel wings out of construction paper and glue them on the lid. Take your straight pin and stick it through the ring or "halo" and down through the top of the glittered styrofoam ball. now that is a sweet angel congrates good one!